Landed recusant families, that is to say those who refused to conform to the new model Church of England, were placed in a curious relationship with their villagers. While not sharing in Anglican worship, they were often responsible for presenting the Rector to the Living, and were certainly expected to apply their patronage and pay for the upkeep of the church. Meanwhile, they retained their own Catholic Priest, and heard Mass in a small chapel in their House - or, if they were as rich as the Bedingfields of Oxburgh Hall, in a purpose-built chapel in the grounds. We arrived at the Hall shortly before closing time, but as we were only really interested in the chapel it didn't matter too much. I have to say though that the Hall magnificent, as you can see from the images below. If you think you've seen it before that's because its been used loads of times on posters, calendars and books, not least the cover of the Norfolk Pevsner. Whatever must it be like to live in such a place? Well, you'd be in the top band for council tax for a start, and the heating bills must cause a few sleepless nights. The Bedingfields probably handed it over to the National Trust with a sigh of relief. 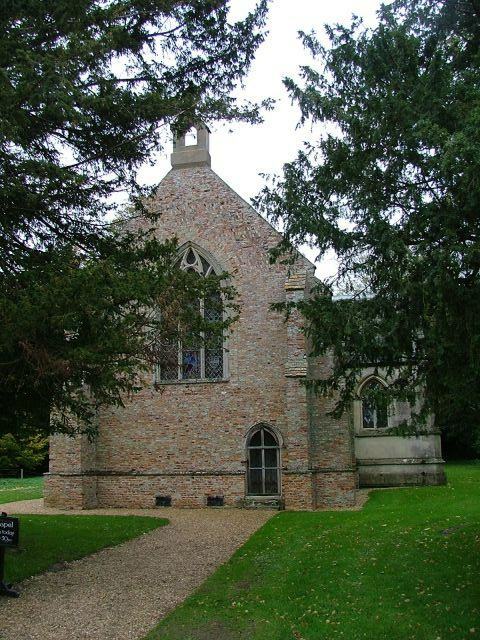 The current chapel dates from the 1830s, and as such is an intriguing example of English Catholic architecture before either the restoration of the heirarchy to England or the Oxford Movement and Camden Society-inspired gothic revival. The architect was not Pugin, as is sometimes suggested, and in fact the great quality of the design is its restraint. The Diocese claim to use it four times a year for what must essentially be showpiece Masses (although the National Trust later denied this), but I understand it is still used privately as well. The chapel sits down at the northern end of the site, overlooking the meadows beyond. Externally it is simple but pleasing, particularly so because of its use of red brick. You enter by going around to the north side. We went in, and the inside was breathtaking, beautiful. Directly opposite the entrance is Henry Paston-Bedingfield's mausoleum, and the light all around is filtered through a collection of medieval and continental glass. But pride of place, up at the east end, goes to the wonderful Antwerp triptych. Constructed in the 19th century from a variety of 16th century resources, it dominates the small chapel in a way these things rarely do the cathedrals in which they are usually found. At this point I did something so woefully foolish that I still occasionally kick myself for it. I went to photograph the triptych without switching my camera to silent mode, or disengaging the flash. I suppose that it took about two seconds for an official to step out of the shadows. "Sorry sir, no photography inside National Trust property. Security reasons." Curses. I was caught bang to rights. Instead of carefully positioning myself in a position where I could brace the camera and take silent flashless shots, I had given the game away. Poor DD hadn't even got his camera out. As you can see, I did manage a shot of the triptych, so I suppose that some international art thief will see it, buy a National Trust membership and carry it away in a transit van. Of course, it may actually be that the injunction against photography exists so that the National Trust can sell more postcards, guide books and tea towels, but "No photography, sir. Fund-raising reasons" wouldn't be quite so compelling. The guardian turned out to be very affable, and we discussed the stained glass as if either of us knew anything about it. I kept hoping he would offer to let me photograph it, but he didn't. So I shall have to go back some time and be more discreet. I once spent half an hour taking photos in the National Trust-owned church at Staunton Harald in Leicestershire. It was only when I came to leave that the wry, sprightly guardian explained the rules. He had spent the last thirty minutes watching me without saying anything. I was so grateful I spent nearly £10 on souvenirs. Postcript, June 2005: Teresa Squires, House Steward at the Hall, was alerted by, as she put it, 'a concerned National Trust volunteer', and contacted me: I am most concerned about your puerile comments regarding the "sneak" photography. The National Trust has a No Photography rule for a number of good reasons, of which one is security. If you had taken the trouble to enquire of the steward, you would have found out that the No Photography rule only applies during public visiting hours, and an arrangement can be made to photograph for bona fide reasons at another time. Your irresponsible attitude is likely to cause others to think they can buck the system with impunity. Remember, the National Trust is a conservation charity, not a subsidised Government organisation. Yes, it is most unlikely that someone will steal this particular altarpiece, but art crime is on the increase everywhere. If you are truly concerned with recording and disseminating knowledge of church history, I would expect you to show a little more respect. Postscript: November 2009: Despite the concerns and protestions of Ms Squires, the National Trust has since relaxed its rules on photography. You can now take photographs in most NT properties, including this one, although the use of flash is still not allowed. I will go back.